It was a matter of great pride for Rustomjee Urbania and Leon's World Centre for Holistic Learning and Development in particular when 5 football players who have been training here were selected to play football in an internationally recognized prestigious tournament. 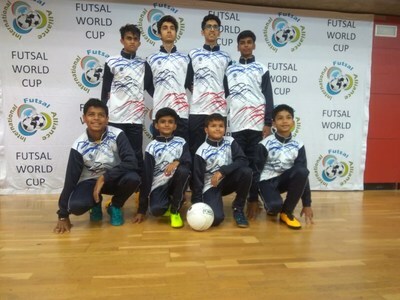 They formed a part of the Indian team that participated in the IFA Youth Futsal World Cup 2018 which was held in Barcelona, Spain from 21st May-28th May organised by European Futsal Association. The young players from Leon's World have been in training under Coach Vaibhav Karpe who is associated with the VK7 Football Academy. 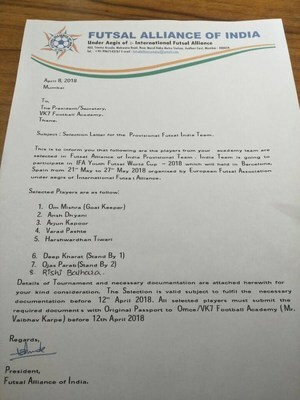 The boys, who have validated all the efforts of Leon's World to ensure the right mix of sports and other co-curricular activities, are - Om Mishra, Arjun Kapoor, Varad Pashte, Rishi Balhara and Ojas Parab. 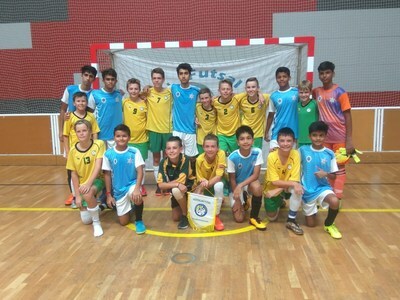 The Indian team played against teams from Australia, Spain and Blanes. Although they didn't win, the confidence they gained on playing against international teams is irreplaceable and has buoyed their determination to train harder and better hone their footie skills. Mr.Percy Chowdhry, Director, Rustomjee Group said, "We at Rustomjee are extremely proud that children who have trained at Leon's World were selected to represent the country at the international level. Leon's World Centre for Holistic Learning and Development is one of the many initiatives that Rustomjee has taken to ensure that 'Childhood's Available' for the children who reside here in the township of Rustomjee Urbania. We stress on proper sports training at the centre and ensure we associate with reputed and experienced institutes and coaches to provide the best for the children. Other than football we also have training in cricket and gymnastics at the centre." The Leon's World Centre for Holistic Development and Learning has been especially established to ensure that the children residing in the township of Rustomjee Urbania have the best possible childhood experience of extracurricular activities. The centre holds regular classes catering to various interests and talents like sport, art, public speaking etc. In addition, Leon's World regularly hosts theatrical plays and also festive events like Ravan Dahan, Halloween etc to encourage a rick cultural milieu for the kids. Leon's World Centre meets the parents exacting demands for quality extracurricular activity options while at the same time doing away with the logistic issues of time and travel that parents face. Leon's World Centre not only offers activities and workshops that stimulate the children's minds but most importantly make it all seem like fun! Rustomjee Urbania houses the Rustomjee Cambridge International School, a renowned IGCSE school, with facilities that encourage academic, athletic and cultural development of kids, with branches in Dahisar, Virar, and Thane. Our Dahisar School is ranked among the top 10 schools in Maharashtra and top 18 in India. Focusing on a skills-based learning program and with emphasis on creative and practical approach, it features among the top 3 when it comes to highest world toppers and India toppers. Our Thane School houses 78 classrooms, a grand amphitheatre, a library, dance and music rooms, well-equipped laboratories, six large multipurpose halls, and a canteen facility for students and staff members. It's safe to say that with school this close by; forgotten notebooks are little cause of panic, and PTA meetings, no excuse to skip work. Rustomjee Urbania also houses 'Leon's World Centre for Holistic Learning and Development' which is a space developed in consultation with experts to provide children a stimulating environment. It caters to different aspects of growth and development. Mentors present at the center guide children in exploring various fields including arts, mathematics and science and language through play way learning methods. The centre regularly hosts the staging of plays, 'open mic' and cultural activities to get children to explore their rich heritage and unplug from the gadget syndrome. So far, the children have enjoyed watching The Legend of Lachit, Ramleela, Wizard from Far West, The Twisted Tale of Beauty and the Beast amongst other plays. They are also introduced to Indian festivals and culture as well as other cultures through fun initiatives like Ravan Dahan and Halloween Party. In the past two years, Rustomjee Urbania has also organized activities such as a Summer Fest, Adventure Carnival, Urban Farm Fest, among other monthly workshops that encourage children and parents to come together and spend quality time.